Smoky Iguana Chipotle Salsa isn't your average, run of the mill salsa. Iguana smoky chipotle salsa is smoky, savory and kind'a hot, as the label says! Made with a heaping helping of red jalapeno and the smoky chipotle, this salsa mixes superbly with the herbs and spices, as well as cocoa, to please your snack loving palate. 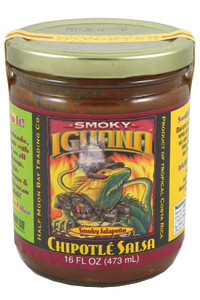 Whether eaten with chips or pour over grilled chicken, Smoky Iguana Chipotle Salsa is yummy! Very bold fragrant and musky with decent heat. Definitely different...but in a good way. A little too intense as a salsa with chips but excellent as a cooking sauce. Name says it. It's smoky. It's chipotle. Fair amount of heat without burning you blind. Very good salsa. Real good with fried pork skins.